Thanks to encouragement from some of you, I attempted my first batch of homemade soy milk, yesterday afternoon. I read up on several different techniques, and then went to it. I made a half-batch (began with 1/2 cup dried organic, non-GMO soybeans) and spent about 30 minutes of actual working time. This working time was simmering a pot of the raw soy milk on the stove. 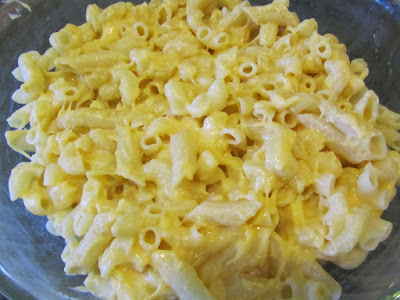 So I was able to also pop a large bowl of popcorn, then make a casserole of macaroni and cheese. My point is, it wasn't like I was toiling away at soy milk-production for the whole 30 minutes. Taste-wise, I have to say, the taste was not awesome for drinking plain. After I took out what I needed plain, for last night's mac and cheese, I added a bit of sugar and vanilla. And then, it was okay for adding to tea, making pudding, cake, chocolate milk, smoothies or cocoa. To be truthful, here, I wouldn't drink a glass of either this soy milk (except if I flavored it) or commercial soy milk, and not even cow's milk, as is. I'm not a milk drinker. This was my first try. I have more soybeans to use, so I'll work at tweaking a recipe to suit my taste. The downside to homemade soy milk is apparently it doesn't keep as long as commercial soy milk, which means I will have to make it frequently. I did soak twice the amount of soy beans, and froze half, so the next batch will have less prep-time involved. Was it worth it? Definitely! I now have a milk substitute that I can use in family cooking that I also want to consume. I think I can make a version that I will enjoy in the exact same foods that I use commercial soy milk (mostly on oatmeal, in tea, coffee and cocoa). But more importantly, trying new things on a regular basis means that I will find many new ways to economize that I wouldn't, otherwise. An update on last Sunday's afternoon project, the pajama shorts that I made for my daughter. She says they're super comfy. That's a thumbs up! Too early in the morning for my brain to be thinking...So pardon my garbled thoughts, but I'm so excited to read about your attempt at making soy milk. We have postponed making ours because we are watching our son's two dogs for 11 days while their family are on vacation in the mainland. The dogs literally lie where we walk so I'm a bit disoriented (not used to pets in the house) and don't want to attempt a new project just yet. But I am so looking forward to making our first batch. Long ago we made soymilk to yield tofu, not primarily to make milk. We're not milk drinkers like you, and would only use soymilk as an accompaniment to cereals and in cooking or making gelatins. I think our price breakdown is similar to yours at $1.30 a pound for dried soy beans, and far cheaper than bought soymilk. I'm curious, what are your plans for the bean residue, that I'm guessing was not cooked? Or did you cook the grinded soy beans, then strain? I wonder if using a soymilk maker would yield a better product. I'm hoping to freeze soy milk in 1 cup potions to use as needed (the same way I keep cow's milk) since we're not milk drinkers. Currently, we have to keep tabs on an opened quart sized carton of soymilk to make sure we consume it before it goes bad. I'm happy for you, that you can now eat milk based dishes with the rest of your family using soymilk. Even at Dollar Tree prices, the cost would have been $4/gal, so you've got the price beat with homemade. And win win that your daughter found her pj shorts so comfortable...So encouraging when a frugal project not only suffices but is over the top. You must be kept entertained with your son's dogs there for a week and a half! Do you know if a soy milk maker would cook the beans or milk for you? The cooking part was the only significant effort on my part, stirring the pot from time to time, then scrubbing the pot afterwards. I'll be interested to know how freezing it works for you. Many people online said that freezing changed the texture to something they didn't like. I had thought about doing that, too, so I would only need to make it once per month. I've got the okara in the fridge for now. I'll look up recipes, and likely make a soy bean burger with it. But it has to be cooked, still. The method I chose was soak the beans overnight, strain, blend with some of the filtered water, strain through cheesecloth, pouring extra water over grounds, then simmering for 20 minutes. There's another method of soaking the beans, then steaming them for 45 minutes, then grinding and straining. That would keep me from having to scrub out a pot and stand and stir the simmering milk. I might try that. I didn't remove the skins from the beans. That's supposed to improve the flavor, but sounded laborious to me. What I plan on trying next time is adding some unsweetened coconut to the blender. That would only add about 10 cents to the batch, and would add fat, as well as flavor. And even at $2/gallon, that is so much cheaper than Dollar Tree, and about even with using on-sale cow's milk. And with that price, the okara is a freebie. A soy milk maker might yield more milk from the soy beans. Where you live, you might be able to find one on the second-hand market. They're kind of pricey, new. Let me know how your attempt goes, and if you can see obvious easier methods or changes. I'm hoping to use it in veggies burgers. As the by-product and not calculated in my soy milk cost, the okara is basically free! Do you have any good recipes for veggie burgers with okara? I watched a youtube video demonstrating how to use a soymilk maker. Seems super easy, just soak the beans, add to the soymilk maker with water, and in 30 minutes (if I recall correctly) hot soymilk was ready to use. No pots, straining, etc. I would very much like to get one, and you're right, thrift stores have sold all kinds of soymilk appliances including tofu makers in relatively brand new condition. I just didn't have the idea to make our own soymilk. However, our last purchase of a case of milk from Costco @ $15.39 for 12 quarts convinced me I should try it. My husband is very hesitant, and I know if the milk is not as good as the Kirkland brand, in the least, then he's going to not want to make our own soymilk. Good idea to add coconut to the milk, that sounds very tasty. I'm trying to find a good, cheap source of fresh coconuts (for making coconut milk and extract). I recall it being sold at the outdoor swap meet. They will even crack it open too, but the price there is still too spendy for everyday consumption. We froze ready made protein almond milk with good results, so I assumed the same for homemade soymilk. I know we can't freeze tofu, it gets rubbery and loses texture completely. But we still freeze tofu when it is near expiration date, and use it in ground mixtures like wonton where all the ingredients are mashed anyway. I'm interested in any new tweaks that you make to your soy milk recipe. Thanks!! as the flavor of homemade with a machine or with a blender and cooking would be the same, just do a test run with your husband, doing it all the long way. If he doesn't like it, then you're only out the $1 for the soy beans for that one time. And at least you know. You may need to add more sugar than you would think is necessary, to match the flavor of the Kirkland brand. I'm convinced that there is a lot of sugar in commercial, sweetened soy milks, as it never tastes right when added to savory dishes. But my unsweetened version, yesterday, tasted fine in the cheese sauce for the mac and cheese. So, there's yet another bonus to making your own soy milk, controlling the sugar content. I wish I could find a soy milk maker inexpensively, here. Just not very common in my area, for people to make their own soy milk, I guess. I freeze tofu, too. I then use it thawed, all mashed up as the ricotta cheese substitute in lasagna. It works just fine. I'll be picking up dried, unsweetened coconut from the bulk bins at WinCo next week. I think it will really help the flavor. You can use the dry, unsweetened flakes of coconut to make coconut milk, for cooking. 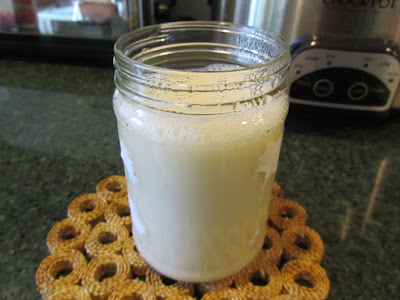 Tell me what you think of homemade soy milk, when you do make it. I added some to my coffee this morning, and I thought it tasted just as good as commercial, in coffee. I'll try it in pudding later, and see what I think. I would love to be able to eat pudding again, one of my favorite childhood foods. Probably very soon... before we need to go into the next case of milk. I'm hoping we can return the case for a refund. I'm definitely interested in flavoring the soymilk with shredded coconut. Should be as good as using fresh when added to cooked liquids. I haven't bought dried shredded coconut in ages, what's a good price in your area? YHF, I'll be buying unsweetened coconut in another week, and I'll let you know the price per pound, here. I plan on starting with just 1 tablespoon of dried, for every 1/2 cup of dried soybeans, soaking the coconut in warm water just before blending. Well, it was definitely worth the experiment if for no other reason than you found a cow's milk sub. for cooking. I hope this means that you are going to get to enjoy more things, especially if you've spent time making them. I think that's the biggest merit of making my own soy milk, that I can eat foods that I fix for my family, that contain milk. I've been, just now, thinking about pudding, something I haven't eaten in years. So, I'm looking forward to that. I'll give the yogurt a try with homemade soy milk, soon. Commercial soy yogurt is so expensive, about $1 for 6 ounces. Just not something I'm likely to purchase. But homemade is really affordable.